Your twenty-something social media specialist may have a different lifestyle than your 35-year-old sales team lead. But ignoring their similarities could cost you. Why? They’re both millennials. The journey to understand this elusive generation has challenged many employers, but making space for their needs and professional aspirations is now a business imperative. The exact timespan for this group is sometimes confusing to pinpoint, but Pew Research defines millennials as anyone born between 1981 and 1996; in 2018, that means anyone ages 22 to 37. Also important to note: millennials now make up the largest slice of the professional world, as the youngest among them enter the workforce this year. To keep this group productive and professionally fulfilled, CEOs and HR departments must understand that “many will quit even well-paying jobs that don’t accommodate their [needs],” cautions the Society for Human Resource Management (SHRM). Many employers are now restructuring benefits as a strategy to attract and retain millennials. 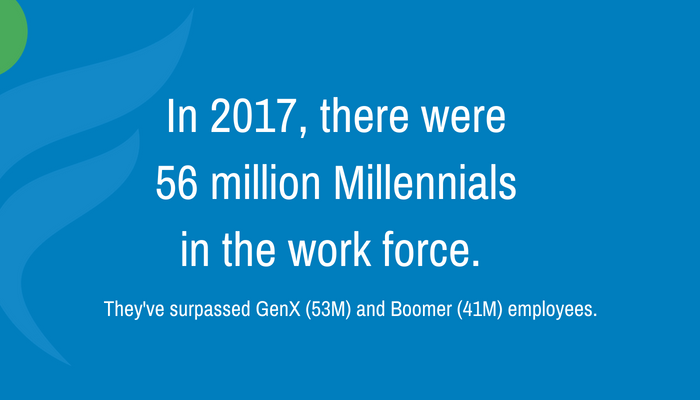 As it turns out, adding these programs is helping companies to hire and retain employees of all generations. So what else does this valuable talent pool want? At IncentFit, we hear from hundreds of mid-sized businesses looking to appeal to a new crop of millennials and to older generations. And they’re on the right track! Millennials are the perfect generation to become passionate participants of a corporate wellness program and to promote a culture of wellness within your company. These employees specifically want wellness benefits that will support their whole selves, not just physical health. That means more of a focus on mental, social, and financial wellness too. Many of our clients get started by launching IncentFit Rewards. It shows that you’re doing more than just talking about employee health and happiness…you’re willing to “walk the talk” and incentivize health with real money. Ready to start connecting with the next generation? Schedule a call with us to design a benefit plan for all types of employees.